Compromise? 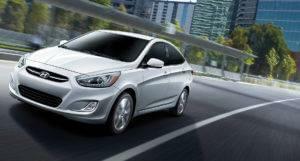 Why would you — step inside the all-new Accent and enjoy more of everything you’ve ever wanted in a sub-compact vehicle. This is the H-Factor. 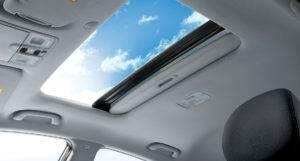 If you enjoy the wind in your hair, you will enjoy the available power tilt-and-slide one-touch glass sunroof. 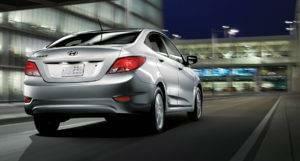 At the touch of a button, the Accent’s roof lets in limitless light and air. 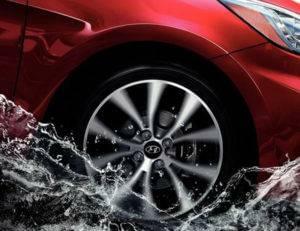 Filling the 2017 Accent’s prominent wheel arches are a set of alloy wheels that immediately capture attention. 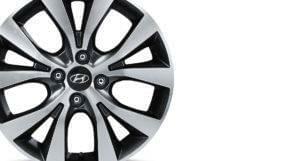 Up to a full 16” in diameter, and fitted with low rolling resistance silica tires, the alloy wheels not only add style, but provide strong grip and stability and give the Accent a purposeful stance. 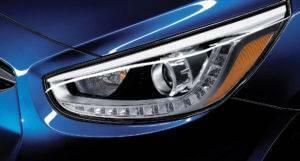 The advanced illumination of the available Projection Headlights with LED daytime running lights will surely lead to full-time admiration given their sleek design, which is also evident in the available LED side repeaters that increase signal visibility to help keep you safe. The sleek design of the available LED side repeaters provide added notification of your intention to turn. Side-mirrors are body colour, power-adjustable and heated to defrost quickly in cold weather. With class-leading cargo space of 600 litres* the 5-door 2017 Accent carries more than you would expect of a compact car. Whether it’s the weekly shop or weekends away the Accent has the capacity to surprise you. 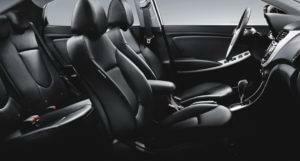 Add to that the flexibility of split-fold rear seats and you have a versatile car when you need it. 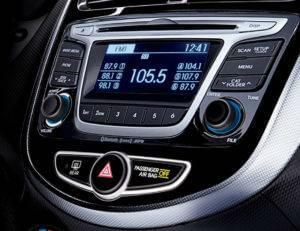 Enjoy the drive as you enjoy n the comfort of the available heated front seats. Even on the coldest Canadian winter day, you’ll find this luxurious feature will make every drive one to look forward to. 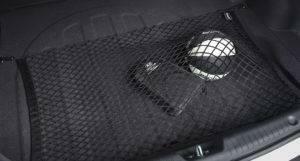 The 2017 Accent has a place for almost anything you decide to travel with. 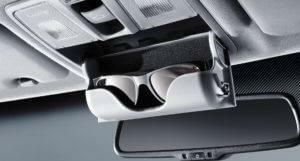 Available features include an overhead sunglasses compartment, front map pockets with bottle holders, a storage tray, dual front cup holders, a sliding armrest storage console, and a spacious front glove compartment — all to keep you organized. 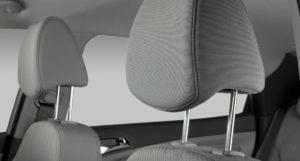 And if you need to store larger or longer items, it also offers standard 60/40 split folding rear seats. Expect more from your steering wheel. The available steering wheel-mounted controls let you navigate personal playlists, change the station, and turn up the volume on the go – all without taking your hands off the wheel. A pleasant climate is essential for an enjoyable trip, no matter the weather. 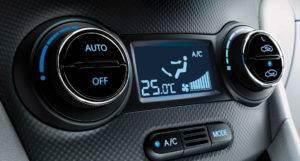 That’s why the available Automatic Temperature Control system allows the temperature inside the vehicle to be customized and controlled along with sensors that ensure it remains the way you want it, with no effort required. Although airbags are a feature you hope to never see, it’s comforting knowing that all six of them are there. 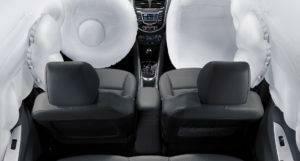 The Accent is equipped with front, front side-impact and side-curtain airbags to help protect you and your passengers if the unavoidable occurs. Designed to help prevent loss of traction, the Traction Control System detects wheel slip and applies the brakes as needed, then transfers power to the wheels that are stable. It’s the type of control you can expect from the Accent. 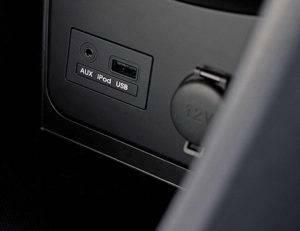 The Vehicle Stability Management (VSM) system comprises of a network of safety features for the 2017 Accent. VSM monitors coordinate advanced safety systems like Electronic Stability Control and Traction Control System to make sure that they are all working in sync, maximizing their effectiveness. 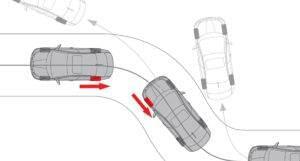 When Electronic Stability Control senses a skid is imminent, it responds immediately. 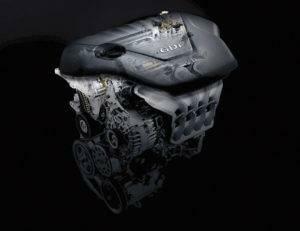 It does this by applying the appropriate amount of braking to individual wheels and adjusting throttle input. This helps keep you on your intended path. Standard on the 2017 Accent are front active head restraints. In the event of a rear-end collision, the restraints move forward before your head moves back, providing added protection against whiplash. Also, adjustable head restraints and 3-point seatbelts are standard for each seating position. 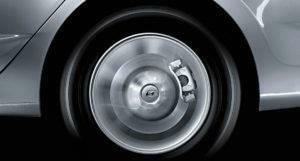 Brake Assist helps detect emergency braking situations and ensures the maximum braking force is immediately applied to minimize stopping distances.